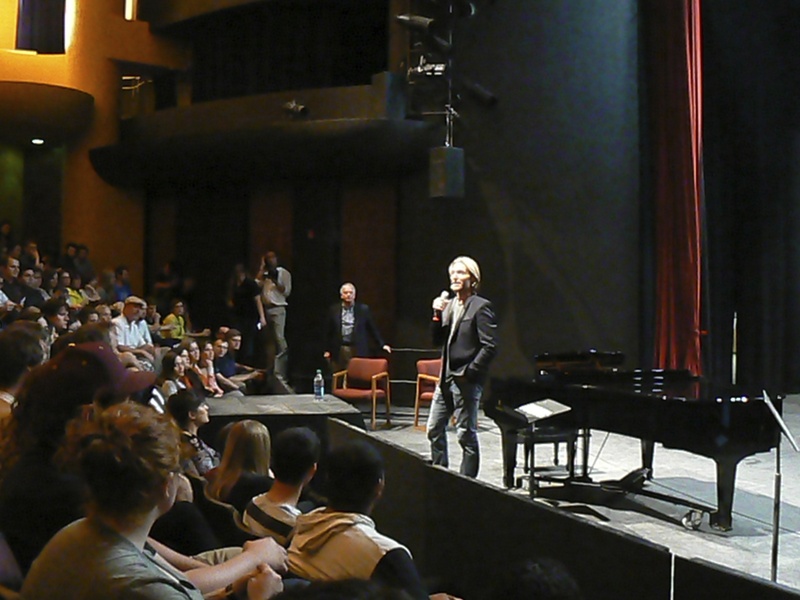 My daughter Codi and I witnessed the brilliance of composer Eric Whitacre last night at Arizona State University. In Phoenix for a corporate speaking engagement, the fact that he offered to do a free, informal choral workshop and Q&A with the students and community, speaks volumes about this man’s quality. 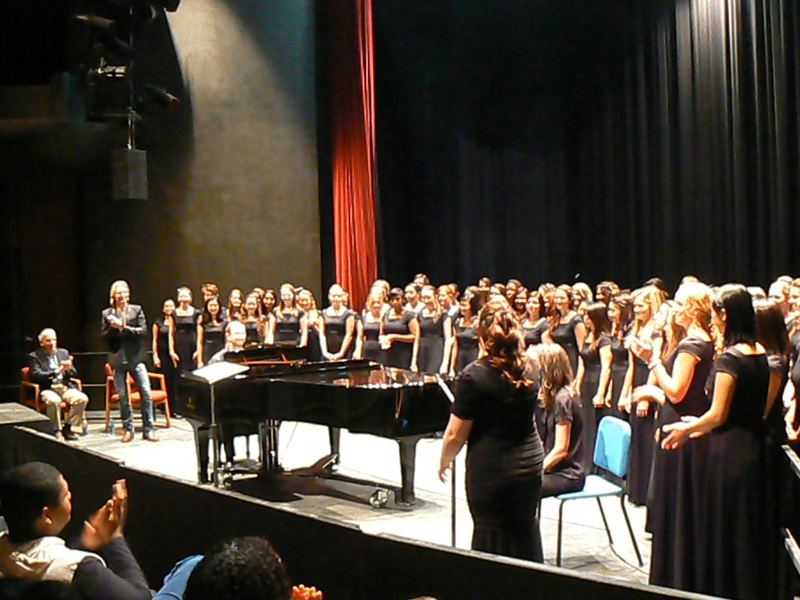 Whitacre entered the Evelyn Smith Music Theatre to a standing ovation, and briefly critiqued one of his early compositions, “She Weeps Over Rahoon.“ The ASU Women’s Chorus performed the piece, under the direction of Ashley Conway, an ASU student earning her doctor of musical arts in music (conducting). ASU Women’s Choir workshop with Whitacre. Participation in the charming, inspirational hour following the critique—as Whitacre answered audience questions—solidified my perception of this man as one of the musical geniuses of our time. Whitacre filled the room with humility, a huge sense of humor, and an indomitable talent. I could share so much, but to avoid gushing even more, I narrowed my comments to fit into seven aspects of Eric Whitacre’s music using the applicable seven-letter acronym: HIGHDEF. Whitacre’s work comes from a deep place of feeling, rather than a development of the craft. He said, at the urging of a Julliard professor, he tried to create music by learning the craft of music, but never could. He must follow inspiration gained from his feelings—sometimes delving him deep into the trenches of emotion—to bring forth the desired result. pieces, “Sleep,” to accompany the words of a Robert Frost poem, “Stopping by Woods on a Snowy Evening.” When he couldn’t get the poem’s rights, he asked his lyricist Charles Anthony Silvestri to help create new text to match the original poem’s exact cadence. You can hear the stunning result for yourself. Whitacre described music as the gold gilt emphasizing certain poignant aspects of a poem —much like scribes, long ago, used gold highlights on passages in hand-copied books. He also described certain poems as vibrating so much with their own meaning, no music could possibly enhance them. The composer also explained how he tried teaching, and other music jobs, but eventually recognized composition as the only job he felt inspired to really do well. He paid his dues: quit his job, immersed himself in writing music, and took every commission offered. The persistence paid off. Most people know Whitacre because of his virtual choirs, which grew from an experiment into a cultural phenom. Thousands of people audition via video, and he compiles the recordings into a “virtual” composition using the submitted videos with added animation. The most recent, “Fly To Paradise,” released three months ago, involved 8,409 videos, and 5,905 singers in 101 countries. Whitacre’s next virtual choir, not yet announced, will involve middle-school-age youngsters. His ideal work right now, he said, would involve working on collaborations with the likes of Radiohead, Byork, Peter Gabriel, movie score composer Thomas Newman, and others. Yessss! The man is known for dissonance in his work, and also silence. One point he made in the workshop portion of the event, so impressed me. He talked to the singers about how to keep the music spinning through the musical rests. The choir responded to this abstract idea beautifully, and the audience could tangibly hear the “music” in the silence. Truly moving. Most listeners cannot help but experience strong reactions inspired by Whitacre’s work. In my opinion, its intensity originates in the man’s personality. I can’t imagine meeting anyone with a more generous spirit, genuine spark for creativity, love for humanity, and non-stop sense of humor. In his short workshop last night, he focused on specific and minute details, including the manner of directing, embodying the emotion behind the words and music, and even how using varying lengths when enunciating the letter “f” lend disparate emotions. The “before and after” flow and sound of his composition changed the piece completely, allowing the audience to hear Whitacre’s brilliant emotional intention. 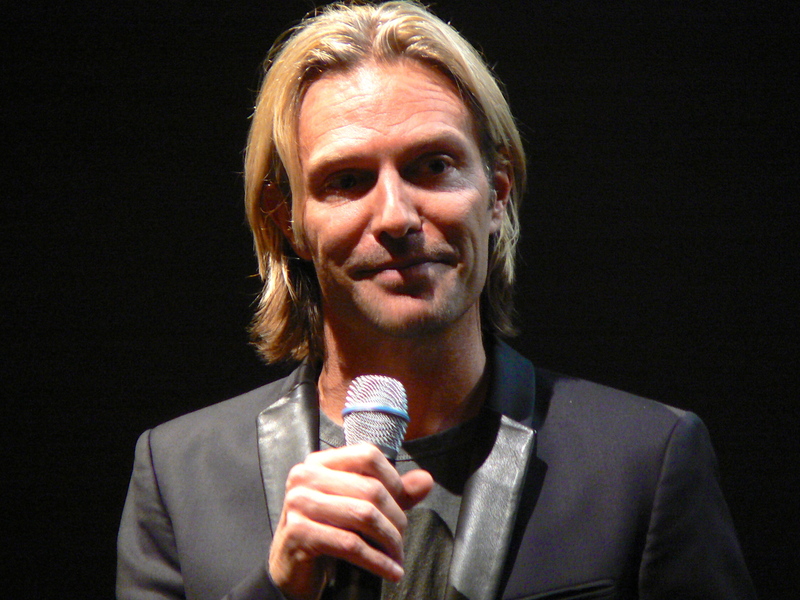 I recommend, given any opportunity, make the effort to attend a talk or performance by Eric Whitacre. HIGHDEFinition quality indeed. This entry was posted in All Posts, Music: Causing Treble and tagged ASU W, Eric Whitacre by Ann Videan. Bookmark the permalink.